Are you overwhelmed with stress in your writing life? The book of Lamentations offers a clear word on how to deal with stress. “When life is heavy and hard to take, go off by yourself. Enter the silence. Bow in prayer. Don’t ask questions: Wait for hope to appear” (Lam. 3:28-29 MSG). 1. Go off by yourself. Solitude often seems impossible for me, even with an “empty nest.” But Jesus knew the importance of spending time alone with His Father. When He needed to listen, He would pull away from everyone. Matthew 14 says that after Jesus fed the 5,000, He “climbed the mountain so he could be by himself and pray. He stayed there alone, late into the night” (23). 2. Enter the silence. When we seek God in silence, often the accuser (Rev. 12:10) tries to distract us with fear, like in the story of Hannah (1 Samuel 1). Hanna’s husband had two wives—talk about stress! And her husband’s other wife taunted her year after year, blaming and accusing God for Hannah’s inability to conceive children. Then, when Hannah prayed, her spiritual leader misunderstood her. “Hannah was praying in her heart, silently. Her lips moved, but no sound was heard. Eli jumped to the conclusion that she was drunk” (13). 3. Bow in prayer. Prayer can be as natural as talking with a good friend or as intimate as sharing a secret whisper. It can occur any time of day, no matter where you are or what you are doing. God promises that if we call on His Name, He’ll listen. “And if we’re confident that he’s listening, we know that what we’ve asked for is as good as ours” (1 John 5:15). 4. Don’t ask questions. My questions often interfere with my communication with God—I’m talking, instead of listening. When Jesus taught His disciples, He asked them on several occasions, “Are you listening to this? Really listening?” (Matt.11:15). 5. Wait for hope to appear. Waiting rooms seem to bring out the worst in me, like my impatience or frustration. But waiting does not have to be hopeless. The psalmist speaks of “waiting” in Psalm 40, “I waited and waited and waited for God. At last he looked; finally he listened. He lifted me out of the ditch, pulled me from deep mud. He stood me up on a solid rock to make sure I wouldn’t slip” (1-2 MSG). Reflection: Matthew 6:30-34 advises, “Give your entire attention to what God is doing right now, and don’t get worked up about what may or may not happen tomorrow. God will help you deal with whatever hard things come up when the time comes” (MSG). So, remember, “When life is heavy and hard to take, go off by yourself. Enter the silence. Bow in prayer. Don’t ask questions: Wait for hope to appear” (Lam. 3:28-29 MSG). What helps you handle the stressful times in your writing life? This entry was posted in Encouragement, Memoir, Non-fiction, Writer's Life, Writing and tagged Karen Jordan, memoir, prayer, stress, Writer's Life, writing, Writing process by Karen Jordan. Bookmark the permalink. Karen Jordan encourages others to tell the stories that matter most as an author, speaker, writing instructor, and blogger at karenjordan.net. A native Texan, Karen now resides in Arkansas with her husband, Dan, near their two children and seven grandchildren. Indeed! I pray each time I sit down at the computer. I wish I could say that I always deal with stress successfully. Thankfully, God is faithful to pull in the reins and remind me to seek Him, when I’ve veered off course. Perfect post for today. Isn’t it wonderful how He always answers at the right moment? Thank you! Patti, I needed the reminder, too! And I wrote the post! It’s funny how God works, isn’t it? As you said in point 1, I go off by myself and I turn off everything electronic. I can’t hear God’s voice when I’m drowning in noise. I find myself praying throughout the day. Even at my day job, when something or someone is frustrating, I’ve started praying for God to give me the wisdom to deal with the situation. It always helps give me perspective and a better outcome than I would have had on my own. So, I took my “break,” and I ended up getting myself into another commitment that I didn’t expect. So, my “break” was really no break at all–it just got me involved in someone else’s plans. I realized later that I had not asked God for His Will–I had simply informed Him of my desires. And once again, I faced the consequences of not seeking Him first. I pray I’ll remember that lesson! Great reminder to not ask questions and wait for hope. Prayer is the only thing that helps me through stressful times in my writing. If I’m not 100% sure about something, God always leads me the way. I love praying for others. Prayer is so powerful but we got to remember to be still and listen. Thanks so much for the reminder. Thank you for your encouraging comment, Martha! Those points about not asking questions and waiting are two of the hardest things for me to do at times! And sometimes the silent waiting provokes doubt and unbelief to raise their ugly heads and try to distract me. But I’m always amazed at how the Holy Spirit reminds me of just the right Word that I need to cast down those distractions. Such great points! Sadly, I totally identify with informing God of my plans versus asking Him what I should do. Thank you for this much needed formula for true writing success. I cannot do this alone, and only get in trouble when I try. It’s refreshing to know I’m not the only one who struggles with running ahead of God. Thanks, Anita! You are definitely not the only one who struggles with running ahead of God! I just hope I don’t have to wander around in my wilderness for another 40 years and never make it into my promised land here on earth! I’m ready to cross the Jordan!!!! Thank you for this excellent post. So often we get caught up in the day-to-day life, we forget to make the time to sit and listen. Earlier this year, the Lord impressed upon me that I had not been spending enough time with Him, listening for Him, rediscovering Him in His Word. Now each day begins with a longer and more focused time of devotion and meditation, of silence and listening. And my writing is better, my attitude is better as the stress is eased, and I’m quicker during the day to comunicate with Him as things come up. My pleasure to share that biblical discovery, Henry. I loved it when I discovered that version of that scripture. And every time I share it with someone else, God shows me another application in my own life. Valuable advice, Karen. I couldn’t do my job as an agent if I didn’t start out my day with prayer. It grounds and centers me and I know that I am helpless to help my clients except through God’s strength. Amen, Barbara. And “I thank my God for you every time I think of you; and every time I pray for you all, I pray with joy because of the way in which you have helped me in the work of the gospel from the very first day until now” (Phil 1:3-5 GNT). These are great thoughts. I’m still striving to start with God every day instead of e-mail, blog reading and writing. In fact, it was supposed to be today. Aaahhh! I just wonder how much better the writing life would be doing that. I agree, Jordyn. It is SO easy to get caught up in text messages, e-mail, fb, blogging, tweeting, writing, etc.–then, I forget to seek God first. I’m grateful that He is faithful to remind me, because I’m so tempted to forget! Excellent post, Karen. I just spent days praying and trudging through a lesson and just could not seem to make progress. Finally, after taking extra time this morning to sit before the Lord, ponder, and (I must admit) beg for help, inspiration came and I finished the lesson in a matter of a couple hours. 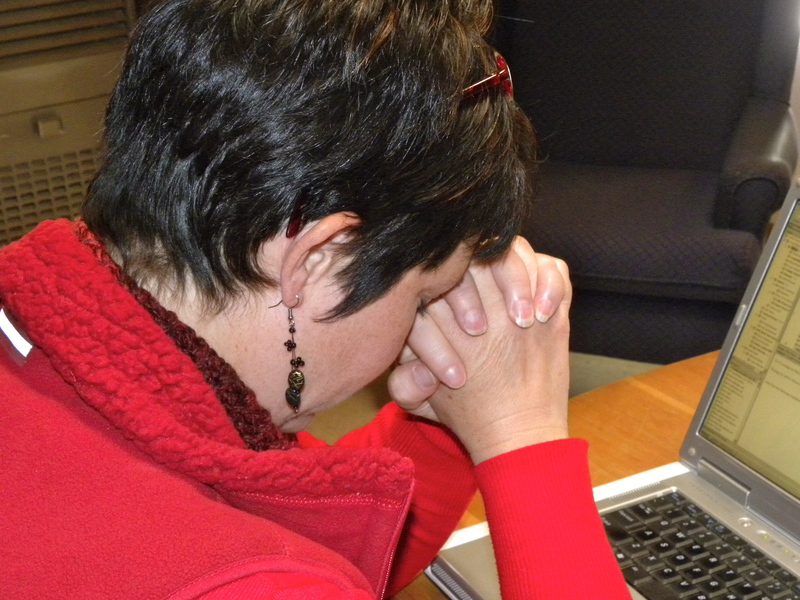 I know, Mindy–why do we forget to “be still and wait” on the Lord! You’d think we would learn by now. But many times, I try to do things ahead of His schedule. For instance, I tried to write one particular book for (dare I say) YEARS. Now, I finally sense His peace to write it. I believe it was all about HIS timing. Yes, sometimes we know exactly what we need to do, don’t we? Thanks, Janalyn. So true. Often solitude is impossible. I like your phrase about finding a “happy space” in your “writing head.” Like speaking to your soul, right? When I’m stressed, oftentimes I write about it, and then I fast because I believe in the power of fasting and praying. Yes. I believe in the power of writing and healing, as well as fasting and prayer. Thanks for the reminder. If I feel heavy in my spirit, it’s amazing how writing out my prayers helps lift the weight of my cares. Like a kiss “goodbye.” Typing them on the computer screen, I put them in God’s hands… It’s just one way, but it keeps me focussed. Yes, journaling helps! And sometimes, it helps me to write my thoughts down; then, tear up the page afterward (or shred/burn/trash it). I guess if I wrote it on the computer, I could just delete it, right? But writing my thoughts down helps me see things from a more objective viewpoint at times. Thanks for the post, Karen, very uplifting. I believe God enjoys quiet. He enjoys it so much that He wants us to enjoy it with Him. Thanks, Tahlitha! Yes, but sometimes it’s so hard to embrace those quiet moments with the world spinning around us. Thanks for your comment!